Cooking 4 all Seasons: A place called home ~ heaven! A place called home ~ heaven! I am back, back from a wonderful vacation spent at parent's home! I am seeing them, after two months and this is our first visit to my home. Bharathy expressed my thoughts so rightly saying 'Amma's place is any girl's best place in the whole world!' Though I have always felt this way, it was more prominent and heart warming this time. Distance bonds more and yearning to their company becomes more pressing. They shifted to the city of Joy, some 5 months back and they visited us last, during our twins birthday. This is the first time that we have lived separately. Even after my marriage, Dad convinced my dear hubby to move down here. And after so many years, we were faced with the fact that we might end up living in separate places for some time. It was really heart breaking, since it was the first time I am ever away from them. Each day passes with great difficulty, there was never a night passed without my daughter crying for my mother and me sharing her feelings. My daughter had the pleasure of spending the maximum time with her and bonds with her so much. Though we speak to each other every day and again whenever we feel like, the thought that I can't see her the moment I want to, pains me so much. When my brother visited them, I wanted to see the pictures taken at their place. But somehow I never did. Each time I speak over the phone, I try to picture how she must be expressing each word and where she might be sitting. Now I had taken enough pictures to colour me when I hear her voice over the phone. Hubby used to tease that we don't have a Mother's place to spend the vacation since they were living in the same building. His wishes came true, when we planned for this vacation. We flew down to Calcutta. Its a first experience for me and my daughter. We were trilled and excited about it. The morning when we scheduled to take off, Chennai saw its worst foggy day. Everything was so foggy and we couldn't see anything. Imagine that in Chennai! We were not sure if the plane was going to take off or not. The 2 hours delay had its effect on all of us. When the captain announced the take off, there was an excited shout from all. Nothing can compare the feeling of first time. I still remember the first time I jumped into a pool as a 10 year old, the same feeling captured me and the feeling was great. The journey to home from the airport was quite tedious and the kids were so restless. The roads were filled with people and so many things. 10 years seems to have taken its toil on the city which had always been so beautiful in my mind. When I last visited the place, I was filled with memories that were so peaceful and wonderful. Now the city has become more crowded and hectic. But it kept to its name of being called city of joy. People celebrated Christmas for 3 long days. Roads were filled with all decorations and excitement runs round all places. We finally reached home, so exhausted and tired. My first sight was, of Amma standing with her arti, after we got out of the lift. It was simply too great. Days just flew and though we didn't really do much of sight seeing, we all enjoyed our stay, simply by staying at home with parents.Also this was the first time we have ever stayed at home for so many days on vacation. We met few wonderful people. Dad had infact, showed my blog to few of his colleagues. I was really trilled to know that they had visited it few times. Dad ensured he meets his grand daughter's needs and everything was waiting for her. Konda refused to come back with us. This week saw me cooking some of our favorite dishes for Dad, though I have already featured most on this blog, I still took pictures of them. So coming days will feature the cooking that happened this past week. Though I wanted to cook something new for this event, I unfortunately find myself having not much time. 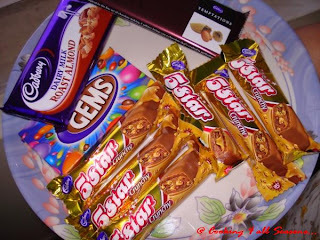 Since Bindiya confirmed its fine with her if I just send pictures of my favorite chocolates, I am sending these, which I took specially for her. These were what Dad had got for my kids. Not to say my favorites too.I am especially so fond of Cadbury's Almond Temptations. 'The only way to get rid of temptation is to yield to it... I can resist everything but temptation', said Oscar Wilde. The most favorite of all apart from Shakespeare. How can I not yield to it. 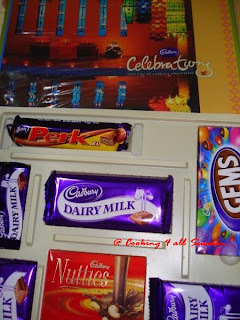 This beautiful picture full of chocolates goes to the lovely Bindiya. when I read the event line quoted by Bindiya, all I could think of, was the beautiful song from sound of music. I just adapted the para with my own liking! If you are in mood to check out my other favorite way of eating chocolate, be sure to check out chocolate Fudge and Eggless Black Forest Cake. Be sure to check out this space for dishes cooked in Calcutta! ah that sounds like a great book title!